Pool service is not always what it seems. Not all pool service companies are the same. When looking for a new pool service provider there are five main points to consider when picking the next company to be in your back yard. Before we get started, it is important to ask yourself why you are here looking for a new company. Did the old company stop showing up? Are you tired of caring for the pool yourself? This is important information to know when choosing your next pool service provider. The first point to understand when choosing a pool company is that there are both good pools service companies as well as bad pool service companies. There are plenty of small companies servicing pools that do great business. That being said there are also large companies out there that do good and bad business as well. It does not matter the size of ones company, there will always be well ran companies as well as poorly ran companies. This will be your first step when looking for a new pool service provider. Make sure you do your research to know if the company does good or bad business with their companies. This article will be using referring to companies that practice good business practices. We won’t waist anyones time talking about the companies out there that do not have the customers best intentions in mind. Lets get started. Now that the first step in picking your new pool guys is summed up, we will now look at the four main types of pool service providers out there. While reading this information know that These types of service providers tend to overlap some of the times. While breaking them down however, we are going to keep them as separate as possible to make things clear. Here are the 4 types of pool service providers. The heavy hitter – THIS IS SPARTA! The first type of pool service provider is the cheap pool service tech. This tech is typically just entering into the industry, and trying to get as much exposure as possible. This pool tech is most likely still learning how pools work, how to adjust water chemistry, and how to diagnose the proper repair. This company usually does not stay in this position for very long. These techs usually start becoming more and more confident and knowledgeable in their work and jump up the the next levels. When they do so they will raise their prices and pull them self off the cheap, cheap shelf. The second reason these techs won’t last is that they totally jump off the shelf. They realize this is not the business for them and don’t want to put in the time to learn the industry and better themselves, so they leave. There are a two good points with these pool service techs. The first one being the obvious, they are not very expensive. They are not confident in their work and charge as little as possible in order to get the job and learn. The two down falls of these companies are that they often make mistakes. Getting into the pool industry is tougher than one may think. It requires a lot of knowledge across a large area of specialties. Plumbing, electrical, hydraulics, and water chemistry. Learning all this information takes time and practice… and mistakes. These techs do over look or even miss important parts of the job. These techs also don’t last very long in this position. Either they quit or are fired causing the home owner to be back at it looking for a new pool service provider. So if you find yourself continuously looking for service techs year after year, an option below may be better for your needs. The customer who should be using this type of service tech is one that doesn’t mine having to show the pool and its issues extra attention through the year. The customer who like things as cheap as possible would need to deal with this pool techs short comings to have the less expensive price. Lets move on. The owner operated pool service company is one of the most popular service providers out there. The majority of the service provider out there fall under this category of pool service companies. This owner wears all the hats within his own company. Two positives of hiring the owner operator is that the owner is the one doing the work at all times. The owner operator is able to control the quality of work due to the fact the he is the one performing the work. A strong relationship between the home owner and the business owner can be made when hiring the owner operated pool service company. With a one man show comes its troubles. The owner operator can not keep up at certain times when the going gets tough. Often these techs max out their work load and can not be in two places at once. The owner operator usually covers small areas as well. Even if the owner operator is the best pool service tech out there, the company may not service your area due to it being too far or out of his service area. Customers should use the owner operator if they are within the boundaries of the service the tech reaches. If the customer is not within the area, or just outside the area, the level of service may suffer. It may happen that the company starts as a owner operator and moves to our next pool service company, the pool business. The business is a pool service company that runs and operates much like a full business does. There are many employees within the business and all with different duties to fulfill. Policies and procedures are in place to make sure the day to day operations run smoothly. Having a pool business service your pool has many benefits. It doesn’t matter the location of the home the pool business will most likely service that area. Also this type of business can get to your problems quickly when needed. Pool business type companies have faults that we will talk about. The techs servicing the pools are only as good as their managers and owners with pool business companies. Managers and owner need to spend as much time with the techs to ensure they are properly trained in maintaining the customers pool. The prices tend to start increasing at this level of pool service. This constant training takes up a lot of time and focus. The pool business type company is only as strong as its weakest link. Customers should often us this type of company when they have a standard pool in the backyard. The pool business employee servicing the customers pool may not currently be up to date on certain aspects of complicated pools. 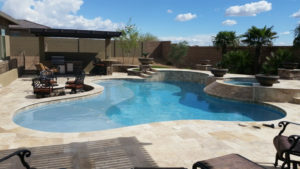 If the customer is needing a pool that has many features to it, they may be better off hiring an owner operated pool service company that knows how to service that type of pool. The heavy hitter is the top dog of pool service companies. These guys are all about marketing and getting as many people to call or come in as possible. The pool business is war to the heavy hitters and there is no time for the small guys. They have brand new marked trucks and typically have a store front or warehouse that customers can come in at. Few companies can call themselves heavy hitters in the pool industry. The heavy hitter is be able to perform any job and will clean any pool in any location. Saying no is not an option for the heavy hitters, they will take on any type of job. Heavy hitters live by the motto, “the customer is always right.” In fact heavy hitters will side with the customers over their own employees. These guys sound great, right? Just like the other service companies mentioned above, the heavy hitters have their down falls as well. They are more expensive than most all other service providers out there. Heavy hitters are constantly dumping money into advertising and their image meaning they have high overhead. They have to make up for these cost by charging more to the consumer. Also, the heavy hitters put the consumer in a box of “customers.” There is no special treatment and no personal touch to any of the customers they service. This makes it very difficult to create a relationship with the owner, managers, or decision makers in the business. Customers who are strictly business are good for the heavy hitting pool business. I hope that reading this information on the different types of pool service companies helps you make a better choice. Choosing the right pool service company is important and should not be a quick decision. We are here to help you make the right decision the first time. Having to rotate through pool service providers is frustrating and time consuming. Even if we are not the pool service type business for you, we are here to help. We can help you make the best decision on hiring the proper pool service company for your business.